Below are some of the men of the Battery ready to leave on the 14th August 1914. The area they are on was known for many years as “the Barracks” just off Hillswood Avenue, it was built on for housing in the 1980’s. Two of the new roads on the estate are named “Barracks Way” and “Nicholson Way”. Also seen below are Major Challinor ready to give the order to march and also Lt Falkner Nicholson who very shortly was destined for his run in with Mrs Tunnicliffe on Derby Street. 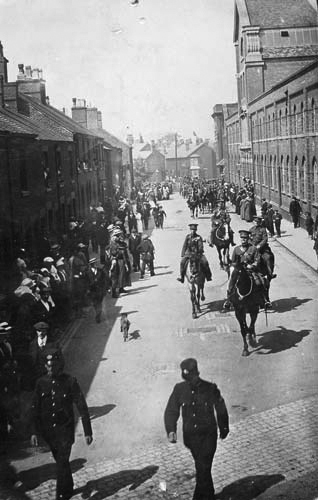 The Leek Battery can be seen below immediately after mobilisation, having just left the Drill Hall in Alma Street and en route to join the Brigade and Ammunition Column in Burton-on-Trent. 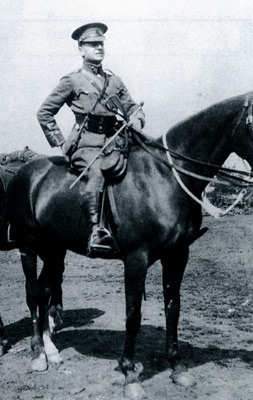 The soldier seen on horseback at the head of the procession is the battery Commanding Officer Major F.W. Challinor. For those from Leek, they may recognise the name from the solicitors Challinor and Shaw where Major Challinor was a solicitor. 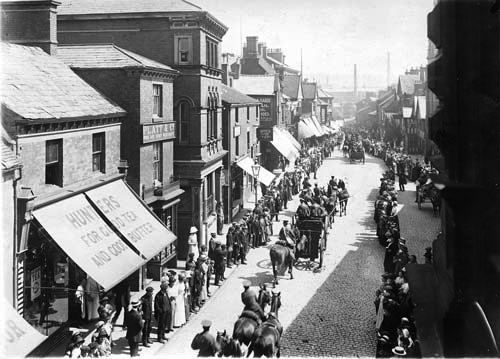 Two incidents happened before the column reached the bottom of Derby Street. 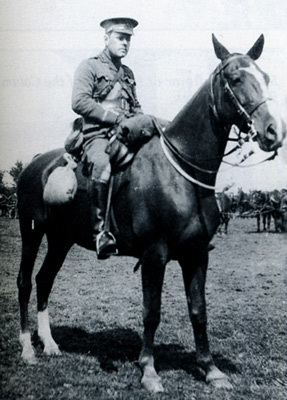 Lt Falkner Nicholson was publicly admonished by a Mrs Tunnicliffe for allegedly mistreating his horse “Drake”, Falkner was renowned in the Battery for his fluent use of “choice” vocabulary but on this occasion was dumbfounded and rode off to rejoin the column. Also due to new, untested horses (and some men) one of the gun carriages was only just prevented from crashing through a shop window. 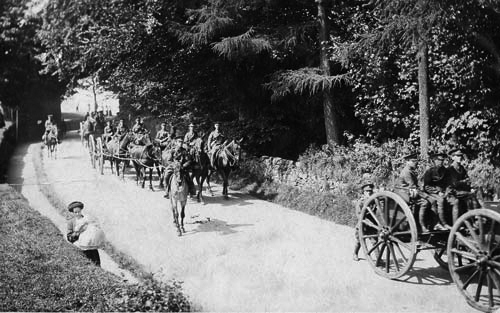 The first break for refreshment of men and horses was at Waterhouses, where two of the Battery were put on a charge after sloping off into the local pub. At Burton-on-Trent they entrained for Luton where the 46th (North Midland) Division was concentrating. The Division arrived in France on 26th February 1915, the 46th (North Midland) Division was thus the first Territorial Division to arrive complete in a theatre of war. The Division’s first few months on the Western Front were spent in the Ypres salient, where Basil Nicholson was to loose his life.